(Helicopter noise as the camera pans over the jungles of Sydney’s Eastern Suburbs) Yes it’s me. I know, it’s been a while, and thanks for all those concerned letters. So nice to know I was missed. My son is with me and now I’m looking after my father and a very active 12-year old. Life is robustly over-stuffed right now. So, where was I …..
Koftas are succulent, Indian style vegetable balls that can be served soaking in sauce or smothered in gravy. A number of vegetables are suitable for making kofta – potato, cabbage, cauliflower, spinach and radish are the most popular. My favourite kofta are made from a mixture of cauliflower and cabbage and served on a bed of steaming hot rice, or as illustrated, couscous. Try these succulent delights either as part of a main meal or as an accompanying savoury. Makes 24 koftas. Heat the oil in a saucepan over moderate heat. When hot, drop in the bay leaves and saute for 1 minute or until fragrant. Sprinkle in the yellow asafetida powder, and fry momentarily. Stir in the tomato puree and basil. Raise the heat, bring to the boil, reduce the heat and simmer for 10 minutes or until a little reduced. Add in the salt, pepper and sugar, remove from the heat and keep warm. Combine all the kofta ingredients in a bowl until well mixed. Roll the mixture into 24 balls. Heat the oil for deep-frying in a wok or deep pan over fairly high heat to about 180° C / 350° F. Carefully drop in 6-8 balls. Fry the koftas for 2 or 3 minutes or until they rise to the surface and start to colour. Reduce the heat to low, and fry for another 8-10 minutes, or until they are a deep reddish brown. Remove and drain on paper towels. Increase the oil temperature to its original temperature, and repeat the frying procedure for the remaining batches of koftas. 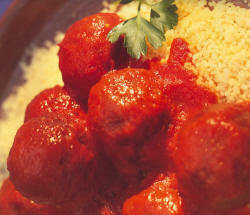 Serve: soak the koftas in the hot sauce 10 minutes before serving time to allow them to fully soak and become plump and succulent.